Developer Jim Winkler, at the podium, addresses the Albany Planning Commission Monday. 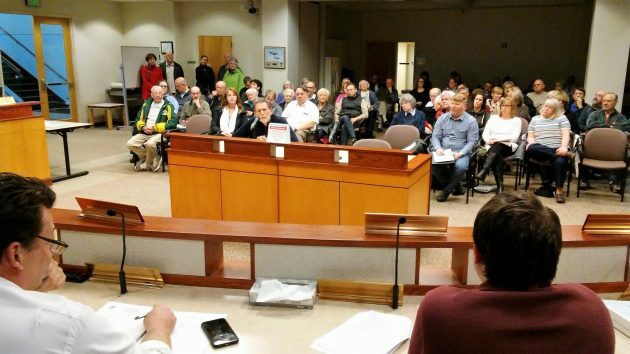 A rezoning request to allow medium- and high-density housing near the North Albany Village commercial center is not exactly popular with at least some nearby residents, judging by the turnout at a public hearing before the Albany Planning Commission Monday night. Other than the applicant, only a representative of Samaritan Health spoke in favor of the proposal. Samaritan has several health-care offices in buildings near the vacant and partially wooded tract at issue. Several other speakers had signed up to oppose the change. The commission went along with a suggestion by City Attorney Jim Delapoer and voted to keep the record open for another seven days, meaning that the commission would reach no recommendation to the city council on Monday night. With the hope for an outcome thus extinguished, I left after three people had voiced their opposition on various grounds. One or more of them said they objected because no specific development was being proposed. They also seemed to worry about increased population density. More density, though, is what urban planning is trying to achieve near business centers like North Albany Village and the surrounding cluster of medical and service businesses including two major Samaritan clinics, the Corvallis Clinic, a new Fresenius dialysis center, along with several restaurants, shops and a planned supermarket in the space formerly occupied by Ray’s. Jim Winkler, head of the development company, testified he was looking for the zone change to allow more flexibility in development of what he said would be mainly housing, perhaps with four or even five floors, clustered to preserve the natural environment including trees. He’s interested in the kind of housing whose residents are less car-dependent than is traditional. The building height limit in the MUC zone is 50 feet, compared to 45 feet under existing zoning. How to order Lasix http://www.dresselstyn.com/site/lasix-furosemide-water-pills/ learn more about this. The existing zone allows up to 317 apartment units on the property. The applicant has agreed to a limit on the number of trips under the requested zoning equal to the 192 peak-hour trips possible under the existing zone. The limit or “trip cap” would become a covenant going with the land, binding future owners. Specific development proposals would be checked, before approval, for compliance with the cap.